Area 3-DK is the ninth course of Teatime Twirl and the twenty-seventh course overall in Mario vs. Donkey Kong: Mini-Land Mayhem!. It is a boss fight against Donkey Kong. The level features six Mini Marios that can be used in the level. The level is an arrangement of several Purple Conveyors that can be drawn. Hammers also appear at the beginning, specifically for taking out the Shy Guys throughout the stage. 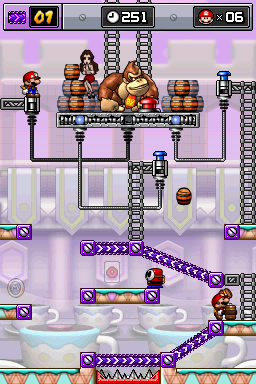 Donkey Kong may occasionally hit a switch, switching the directions of all present Purple Conveyors. He may also pound the ground to cause some Barrels to fall down; hitting these will cause a Mini Mario to break, though they can be blocked by any kind of Conveyor. The Mini Marios must climb the Ladders in order to run a spark through each wire and electrocute Donkey Kong. The M-Token is located at the middle left, below the left Ladder. In Plus Mode, it is located at the middle left, below the right Ladder. The Mini Mario Card is located at the very center, below the center Ladder. In Plus Mode, it is located at the very center, below the center Ladder. In order to earn a Trophy, the player must score 12000 points. There is no specific order of Minis in Plus Mode. Donkey Kong will also summon Fires instead of Barrels, and all of the Shy Guys are replaced by Fires. This page was last edited on February 22, 2018, at 01:01.